From the ordinary design to the custom creation, Eddie Harris designs western treasures for the avid horseman as well as the fashionable lady. Custom spurs take about 6-8 weeks. Mike has been mapping out intricate saddle designs for over 24 years, crafting each with the adequate measure of time and craftsmanship. It's a very unassuming destination. Other than the fact that a big-rig cozies up to the main building, there is no indication of the life inside, of the artisans at work beyond the doors. Many have sat in the same chair, walked through the same doors, chiseled out unique compositions for over a quarter of a century. In the showroom, eloquent saddles line the walls while spurs, halters, belts, boots, blankets and the like take their place on shelves and floors. 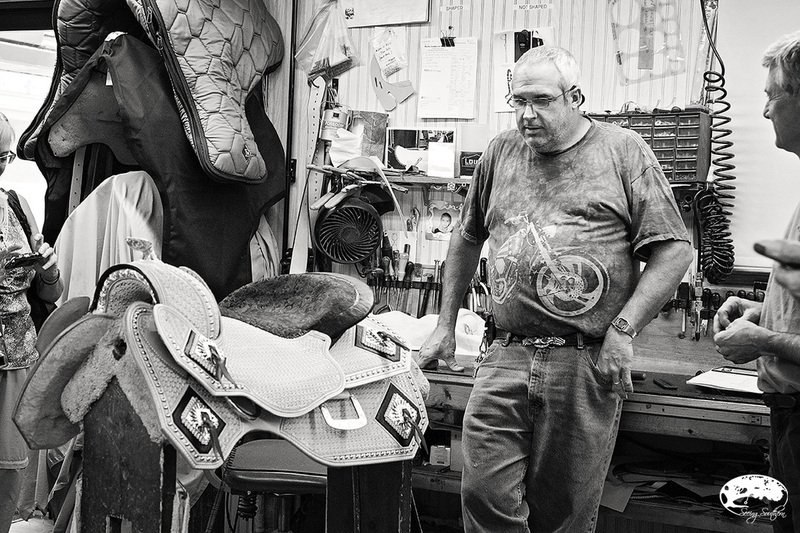 Space is at a premium because just beyond these walls are men and women in full production mode, churning out leather and silver creations that astound even those who have never or will ever mount a horse. This is the home to Eddie Harris and Harris Leather and Silverworks, and to his staff - or his family, as he would call them - who live the mantra daily that old world craftsmanship is the only way. Isn't it just like a Southern gentleman to have gained his trade from his parents, more specifically, his mother. Back in the 60s, his mother learned to tool pocket books and belts, back when the "hippie craze" was in full swing. His father would admire her handiwork, adding a little shine and sparkle, a buckle here and there. Soon, the couple noticed that people wanted to buy what they had made. As children do, they watch parents. Eddie saw what was happening and the admiration people had for their designs. After college, he declared his calling was the same. His grandparents "thought he was crazy" to want to do this full time. As a 25-year family operation, Harris promises their focus remains on quality, "to stand behind what we make." Every production is 100% American made with American materials. 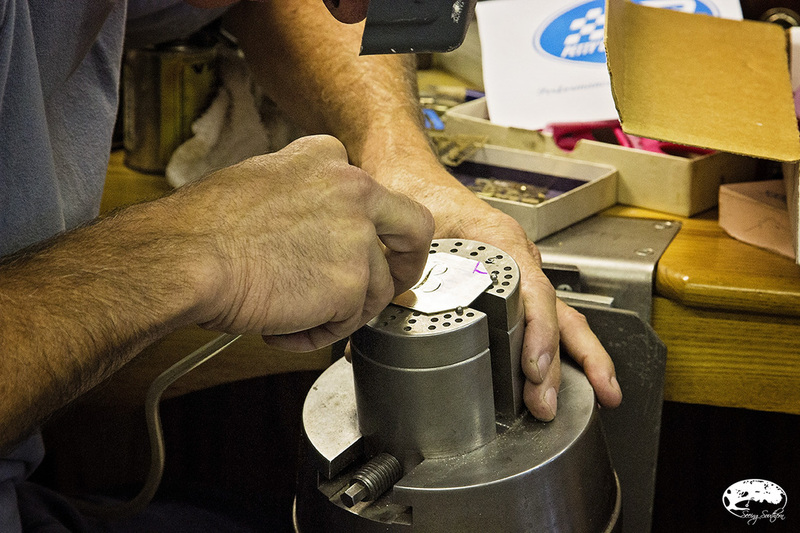 With total customization of each product, it takes, on average, six months to a year to complete the saddle. Some saddles have sold for as much as $27,000, but Harris states that he produces the "highest quality in the industry" and will work within a given budget. He works with complex breeds of the horse industry, Quarter Horses, Paints, Appaloosas and Arabians and understands fitting the rider to the saddle to the horse. Harris is a huge proponent of agribusiness. He serves as a county commissioner in Surry County, North Carolina, and believes in how the small businessman that makes a huge different in the economy. It "depends on the quality and what you're making. I believe there's a large percentage that wants quality and will pay for it." Even though he learned leather and silver "through the school of hard knocks," he believes he is better today because of the struggle and the time he afforded in learning the process. 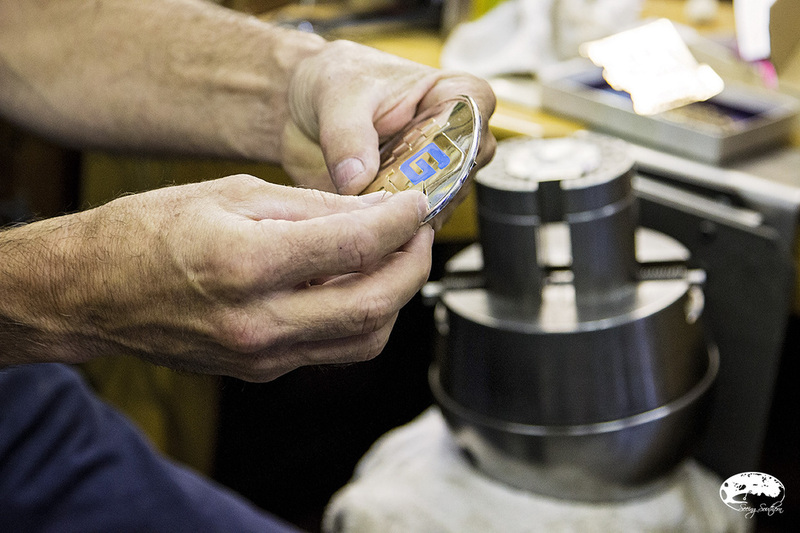 Today, he only works with silver, and he confirms that "most country people make good things with their hands." He is proud to have lots of those country people sitting beside him daily. From silver . . . 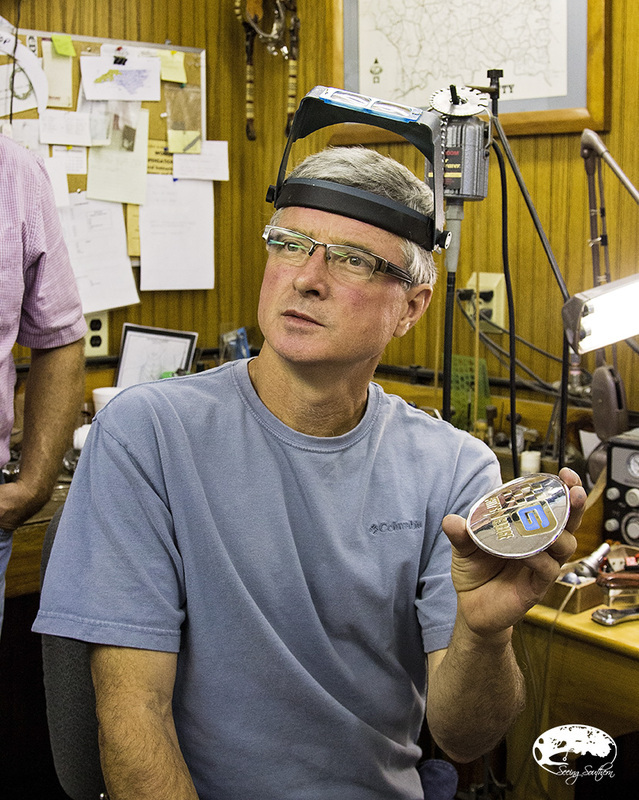 In the course of a month, Harris Leatherworks will purchase over $15,000 in silver. For a customized saddle, it will take from six months to a year for completion, complete with hand-etched silver and leather. Harris's custom silver work is "noted for a heavy layered dimensional look, robust in depth and relief, with a heavy gun scroll influence." In the blink of an eye, he picks up a blank canvas of silver, and by hand, forms a "B" in a script that would take an average someone years to perfect. His success with engraving monograms and letters happened through trial and error until he mastered the art of hand engraving. On the day of our visit, he works on Richard Petty's belt buckle, emblazoned with the words, Petty's Garage (right). 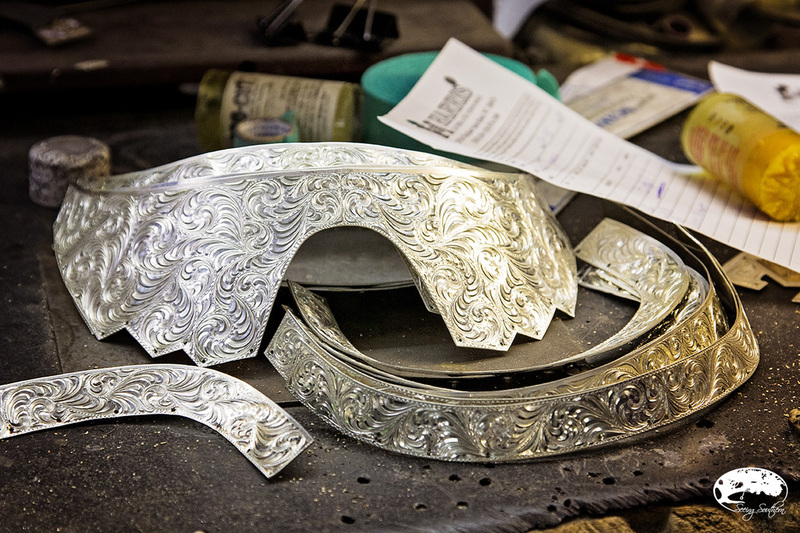 With elements of gold mingled within the silver, the buckle will set Petty back about five grand, but in the end, the handiwork is handmade and priceless. Andi McDowell, George Strait, Kate Upton and Tony Stewart - with their own Harris designs - agree. "We will maintain quality and keep an eye on it," says Harris. Just for fun, he works on an etching inspired by Kevin Costner's Robin Hood film. Just for fun, he says with a smile. Come by anytime. They'll treat you like family. If you need more proof of their magic, follow this link.